For Thanksgiving a few years ago I wanted to make a perfect turkey. I looked in "The New Best Recipe" and they had a great section on it. 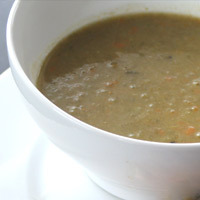 I combined their method with my own ingredients and Sierra's Leek Soup. It turns out perfectly every time! If you don't want to make the soup just follow the instructions for the chicken and turkey. In a large container mix the water and salt for the brine. Add the chicken or turkey. Place in the refrigerator or cover in several cups of ice at room temperature. You may need to add ice half way through the brine. Brine the chicken for 1 hour or the turkey for 2 hours. Place a cooling rack on top of large rimmed baking sheet. 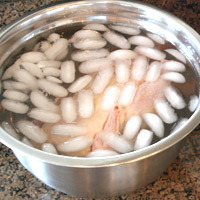 Remove the chicken or turkey from the brine. Rinse the outside and the cavities. Pat dry with paper towels. Set on the prepared cooling rack. Place the in the refrigerator uncovered 2-4 hours for either meat. 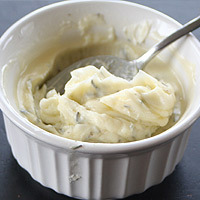 Soften the butter to room temperature. Chop the herbs and mix into the butter. Position an oven rack on the lowest setting and remove all other racks. Preheat the oven to 425. 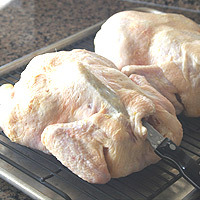 Loosen the skin of the chicken or turkey using a knife if necessary. Distribute the butter under the skin. Salt and pepper the outer skin and cavities. Quarter the lemon and garlic cloves and stuff them in the large cavity. Line the roasting pan with foil for an easy clean-up. Place the v-rack in the roasting pan. Place the chicken or turkey on the v-rack, with the bottom side of the chicken or turkey facing up. Roast the chicken for 30 minutes or the turkey for 45 minutes. Using paper towels to protect your hands, turn the meat on its side. Roast 15 minutes (chicken or turkey). Turn to the other side. Roast 15 minutes (chicken or turkey). Turn it top side up. Roast 10-15 minutes for the chicken, 20-30 minutes for the turkey or until done. While the meat is drying in step 2, rinse and chop the leeks. Peel and chop the carrots, and potatoes. Place them in the bottom of the roasting pan. 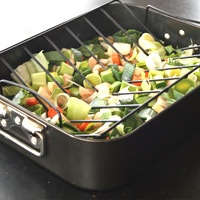 Place a v-rack on top of the chopped vegetables. Pour the broth over the vegetables. 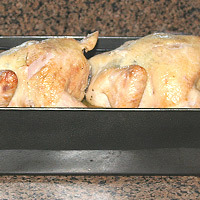 Place the chicken or turkey on the v-rack and roast as described above. 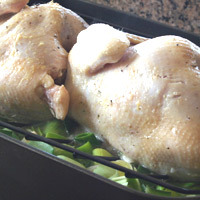 Remove from oven and remove the chicken or turkey to a slicing surface to rest. 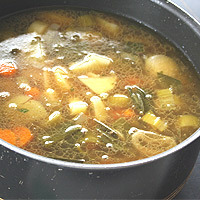 Transfer the vegetables and broth to a large pot. Skim off the fat on top. Using an immersion blender, process to desired consistency. Add salt and pepper to taste. Serve hot. 1. In a large container mix the water and salt for the brine. Add the chicken or turkey. Place in the refrigerator or cover in several cups of ice at room temperature. You may need to add ice half way through the brine. Brine the chicken for 1 hour or the turkey for 2 hours. 2. Place a cooling rack on top of large rimmed baking sheet. Remove the chicken or turkey from the brine. Rinse the outside and the cavities. Pat dry with paper towels. Set on the prepared cooling rack. Place the in the refrigerator uncovered 2-4 hours for either meat. 3. Soften the butter to room temperature. Chop the herbs and mix into the butter. 4. Position an oven rack on the lowest setting and remove all other racks. Preheat the oven to 425. 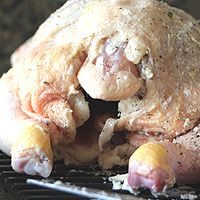 Loosen the skin of the chicken or turkey using a knife if necessary. Distribute the butter under the skin. Salt and pepper the outer skin and cavities. Quarter the lemon and garlic cloves and stuff them in the large cavity. 5. Line the roasting pan with foil for an easy clean-up. Place the v-rack in the roasting pan. 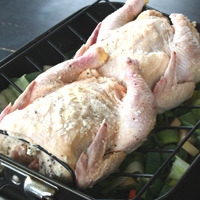 Place the chicken or turkey on the v-rack, with the bottom side of the chicken or turkey facing up. Roast the chicken for 30 minutes or the turkey for 45 minutes. 6. Using paper towels to protect your hands, turn the meat on its side. 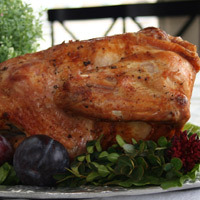 Roast 15 minutes (chicken or turkey). Turn to the other side. Roast 15 minutes (chicken or turkey). Turn it top side up. Roast 10-15 minutes for the chicken, 20-30 minutes for the turkey or until done. 7. Remove from v-rack and place on a slicing surface. Remove the garlic and lemon from the cavity. Let the meat rest 10-20 minutes before slicing. Slice and serve. 1. 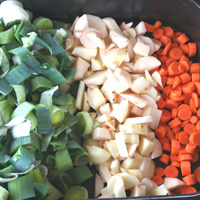 While the meat is drying in step 2, rinse and chop the leeks, carrots, and potatoes. Place them in the bottom of the roasting pan. 2. Place a v-rack on top of the chopped vegetables. Pour the broth over the vegetables. 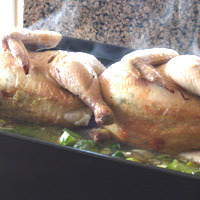 Place the chicken or turkey on the v-rack and roast as described above. 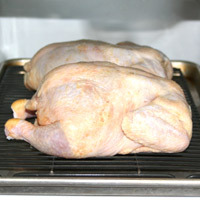 Remove from oven and remove the chicken or turkey to a slicing surface to rest. 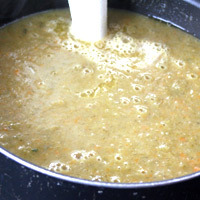 Transfer the vegetables and broth to a large pot. Skim off the fat on top. Using an immersion blender, process to desired consistency. Add salt and pepper to taste. Serve hot.